Religious revival in the 1830's created a bit of a space squeeze in Danbury. There was little objection when five Methodists living in what is now Bethel formed a new congregation, meeting first in a house on Blackman Avenue. During the following ten years, the membership grew and they met in a series of sites in downtown Bethel. In 1848, a "permanent" meeting hall was built on what is now the site of the Masonic Hall. At about the same time, the first full-time minister was appointed. Despite Civil War clouds, growth continued and a larger building was needed. In 1860, work was begun on our present structure. It was dedicated in August of 1861. A fire in 1884 forced a significant restoration. Gradual changes continued over the next sixty years as Bethel grew and the nature of the population changed from rural to suburban. By 1943, another major restoration/renovation was necessary. The kitchen and secretary and pastor's offices were added at this time. Plain windows replaced stained glass. Randall-Wright Hall was built in 1967. An inspired move, it gave the Methodists the only accommodations for a church school among the Protestant churches at a time when Bethel experienced a population explosion. New Bethel families found here a friendly church with the facilities to serve them. In 1971 lightning destroyed the steeple. Its rebuilding was the fourth time for our steeple. 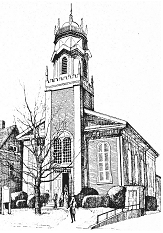 In 2001 the steeple support structure received yet another significant renovation due to sinking footings. The popularity of the ministry of the Bethel Methodist Church brought a related problem - parking. Our neighbors to the east refused to allow parking behind their building. After extensive and exhaustive negotiations, the decision was made in 1997 to purchase the building. This resolved the parking issue and ensured our “downtown” presence for the coming decades. The building was subsequently named the “Johnson Building” in honor of our 42nd minister, Reverend Robert Johnson. Besides the demand for a church building, another concern has been a parsonage. In 1894, the house to the west of the sanctuary was built. This replaced a smaller one, which was sold and moved. The cost of heating this new house eventually forced the church to give it up, and it was traded for one on South Street in 1950. This proved to be inadequate, and in 1974 it was sold and replaced by the present parsonage on Governor's Lane. Early in the 1970’s, recognizing the need in our community for good pre-school education, Randall-Wright Hall was upgraded to meet state regulations and the Village Pre-School was opened. The Village Pre-School has built its reputation by helping children become independent, self confident, and inquisitive learners. Helping children get off to a great start in their schooling careers. The first pastor to serve our church was the Rev. Levi Percy (1847-48); the longest serving was the Rev. Robert Johnson (1968-2001). In 2006, Rev. Johnson was named Pastor emeritus of our church. By our count, Pastor John Parille is the 46th minister to serve the congregation.